First mare in the records Michalów was Miriam ( Mlech Pełkiński x Gahdar by wielki Szlem) bred to Nowy Dwor , who after training in been assigned here yet half-horse. Following the decision of the Minister on the establishment of the Arab horse, late autumn 1953 years to Michalów moved mares with their foals from the closed facility in Klemensow near Zamosc. The first transport (17/10/1953) arrived 21 mares, and the second (25/11/1953) - 3, and the foals born in Klemensow in 1953 - along came 18 This state expanded eight young mares race training after the completion of the TWK Wroclaw, 25.11.1953 came to Michalów. · LINE II. Mlecha or. ar. : Akra (Kaszmir x Atfa by Dżingishan III) , Mufta (Mlech Pełkiński x Atfa by Dżingishan III) , Delja (Wielki Szlem x Akra by Kaszmir) . · LINE V. Milordka: Amneris (Amurath Sahib x Elsissa by Floks) , Armenia (Witraz x Amneris by Amurath Sahib) , Bajadera (Morocz x Elsissa by Floks) , Gałka (Marabur x Orda by Omar II), Gwara (Wielki Szlem x Canaria by Trypolis) , Lala (Amurath Sahib x Elsissa by Floks) , Orda (Omar II x Malaga by Mazepa II) , Saga (Hardy x Jaga II by Koheilan I ) , Cosmosa(Wielki Szlem x Canaria by Trypolis) . · LINE 36. Scherife or. ar. : Brusa (Amurath Sahib x Brzytwa by Mersuch I ). 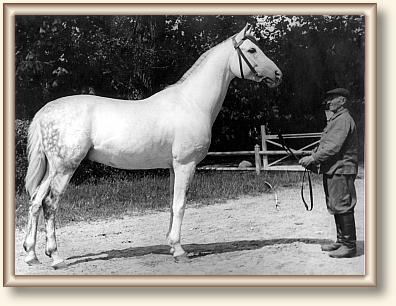 Among them was a mare of fundamental importance for breeding Michałów - Estokada. Created by her family in the Michalow stud issued the largest number of champions. · 17. Koheilan Adjuze or. ar. - used 1 stallion. · I. Gazella or. ar. · II. Mlecha or. ar. · 34. Semrie or. a..
Horses Michałów from the beginning represented mostly type Saklavi - were slightly higher than the Arabs in other studs, comely, and most often gray. A small number of horses in the type munighi (about predyzpozycjach racing, but less comely) has been eliminated over the years, as a little typical. Currently, horses are horses Michałów comely and also brave racers.